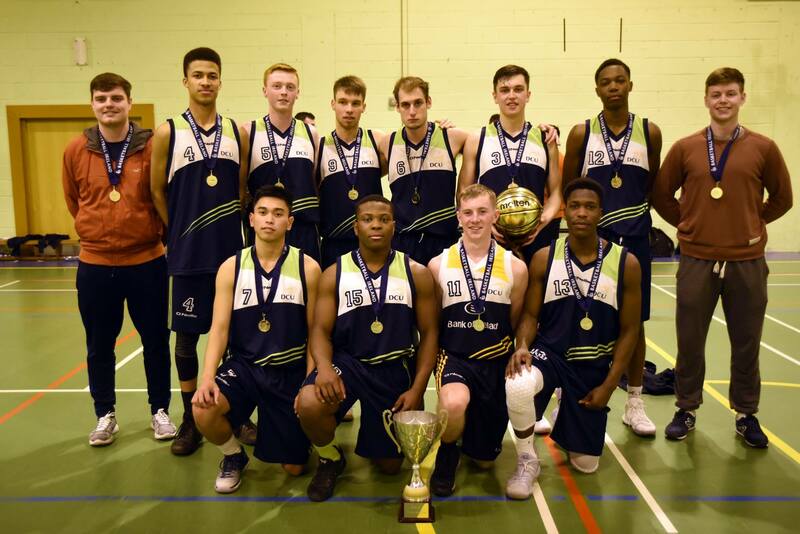 DCU Men’s Freshers Basketball coach Gavin Doyle said claiming the All-Ireland Freshers title in his first outing as a coach was an “incredible feeling”. The Glasnevin side triumphed 45-26 over UCC in the final, despite missing a few key players from the side, and Doyle was delighted afterwards, having won a second title in three years for the college at this level. “I was over the moon,” Doyle told The College View. “This was my first time ever coaching organised basketball so it was an incredible feeling going undefeated. Obviously I was delighted after the win, but to do it with such a great group of lads who aren’t just my players but some of good friends was the cherry on top. “I was expecting to be competitive, but I didn’t think we would win until we started playing. “We actually had about 15 lads selected, but we lost 2 boys to U20s National Cup the same weekend, one was returning home to Germany the same weekend, one couldn’t commit to the weekend and on unfortunately got badly injured the week before the tournament. At Fresher level, with an influx of talent coming in to form a new team every season, creating a proper team spirit is the first challenge, but Doyle was quick to praise each individual player, saying the lack of an out-and-out star in the side helped them gel as a unit better. “Our team didn’t have any stand out players and I thought that would be our downfall,” he said. “However, it played in. our favour as we played well as a team and all 10 players contributed. “A lot of the boys play up to the varsities such as Stephen Allen, Vincent Achukwu and Eoin Murphy. Stephen is a great young player who has improved tremendously over the pass year and could play Superleague if he wanted. “Eoin Murphy is working his way into the Templogue Superleague team, who won the regular season last year. Vincent is very young only 17 years old and I can see him working his way into Killester Superleague team over the next few years. Stephen Allen, part of the victorious squad, echoed the thoughts of Doyle. “Coming into the tournament we obviously wanted to win it, but with injuries to two of our big men in the two weeks before the tournament we weren’t too sure how we’d get on against the bigger teams,” Allen said. “But after the first game of the tournament beating a big team like UCD by two we knew we were going to be hard to beat. It is that lack of a star, however, that in many ways holds back DCU at senior level. The senior Women’s and Men’s basketball sides both enjoyed All-Ireland success last year, but while the Women’s came in the top A Division, the Men’s side triumphed in the second tier of competition. Since winning promotion, the DCU seniors have found it tough going in the A class, going 0-3 for the season so far against GCD, UUJ & LkIT – and what powers these colleges on is exactly what was missing from the DCU Freshers success – the star players. “DCU usually struggles competing at this level in Men’s basketball due to the reason that DCU are one of the only colleges, if not the only college, that does not have an American Scholar playing for them,” said Doyle. “Compared to the three teams we played against, GCD had 2 Americans and other Scholars, UUJ had 3 Amercian and 7 other Scholars and LkIT had two American Scholars. Allen, who plays for the senior side, also sees it as a hindrance, but maintains that a slow growth in the overall standard in the college will feed through to top level. “It’s great too have the success that we are having but in terms of a National Men’s A title, I don’t think were quite there yet,” he noted. “Playing against colleges around the country you can see how important Americans are to them and without having one ourselves we find it hard to compete against the more stacked colleges.